BUT, you’ll have to wait until the end of the post. 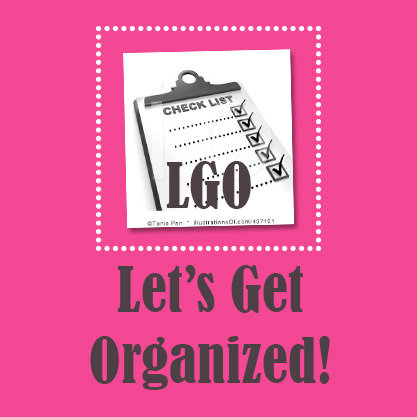 So, you might as well read all about my organizing plan for this week. I’m actually excited about organizing this month. I’m doing a room that REALLY needs it!! 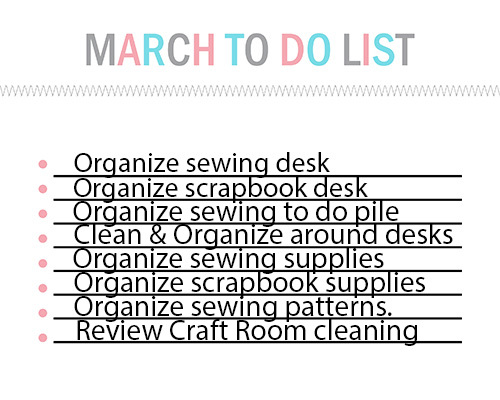 This month I’ll be working on organizing my craft room. I know, it’s probably getting old how often I talk about having to organize my craft room. It’s seriously the hardest room I have to keep clean! I’m sure I’ll come up with some more things to clean along the way, but for now this is my list. This week I will be working on cleaning off and organizing the desks in my room as well as a few of the shelves with supplies. I think I need to make this a weekly chore so that my room doesn’t become so horrible all the time. I’m constantly losing things I need and I never have a clean surface to work on. It drives my husband crazy, even though he doesn’t use it even a quarter of the amount I do. It drives me crazy too, but I’m too lazy to change my ways. SO, this month I am going to start to change how I do things. 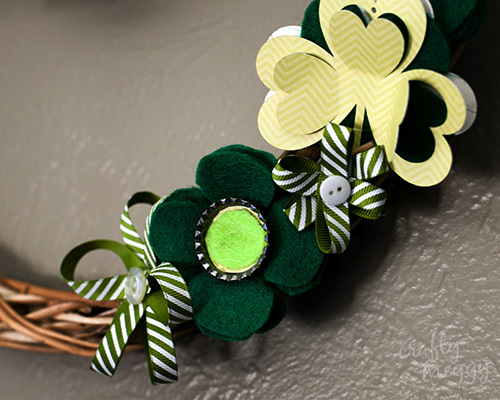 When I craft, sew or blog I am going to always give myself enough time to clean up after I’m done. I will also be working on my monthly organizing goals as well. I have decided to start doing them on the same schedule to make sure I keep doing them every month. This week on Monday, Wednesday and Friday I will be organizing the garage, cleaning under the kitchen sink (thoroughly), and organizing the pantry. Now that business as usual is over, we can go onto what you’ve all been waiting for…. 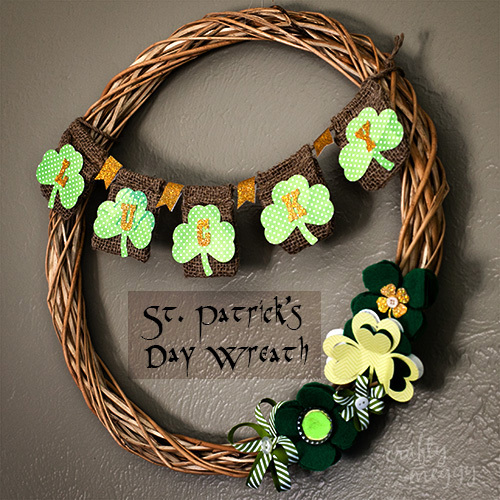 This is my wreath that I finally sat down and made last Friday night. I LOVE it!! I found the inspiration for it on pinterest, but mine turned out quite a bit different than the inspiration photo! 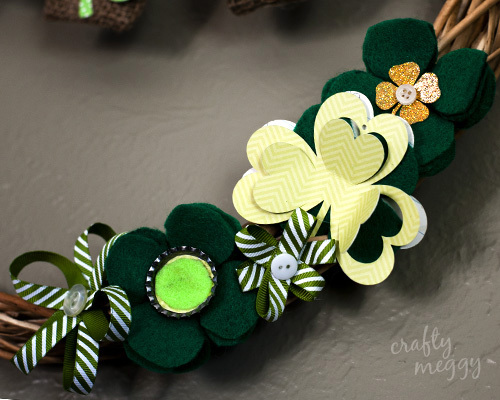 I’m glad too, I want my crafts to reflect me and my craftiness. I had so much FUN making this!! I was in a local craft store, Porter’s, and saw these burlap little pouches that came attached to burlap rope. They were the PERFECT size for this project AND they were on sale so I snatched them up. I also bought some expensive gold glitter cardstock. It was almost $3!! I couldn’t believe it, but I LOVE how it looks so I’m not complaining. I bought some shamrock shapes from the Silhouette Online Store and found a cute 3 leaf one that I liked. 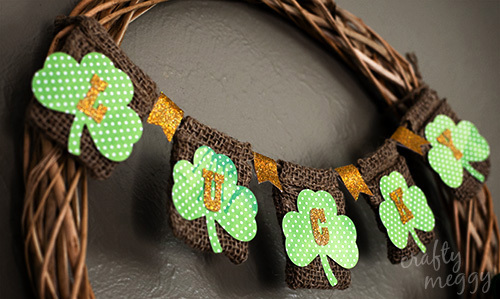 I also bought a font from the store called, Whale Tail, and I used that for the word Lucky. I made the little flags myself from a shape I already had. 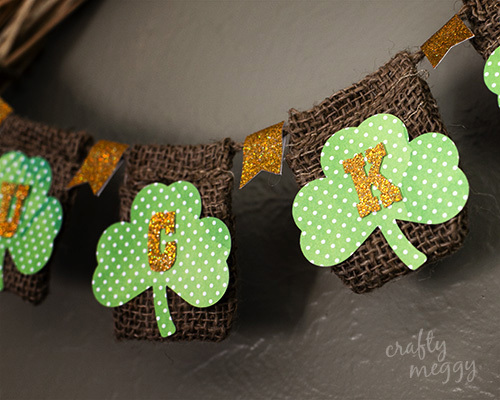 I want to use the glitter paper so I had my silhouette cut out the shape with a dotted line in the middle so it would easily fold over. 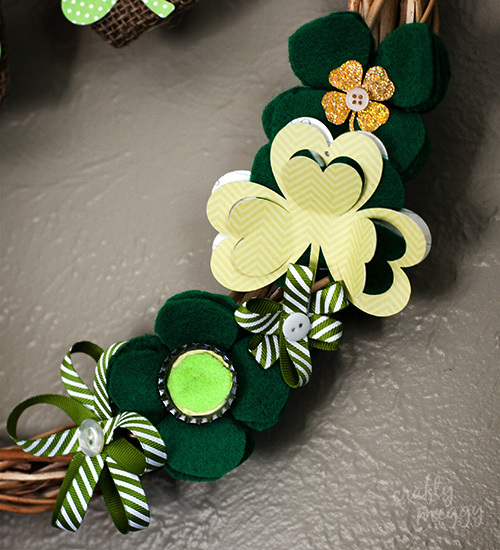 I used hot glue to glue everything together before attaching with the glue gun to the wreath. 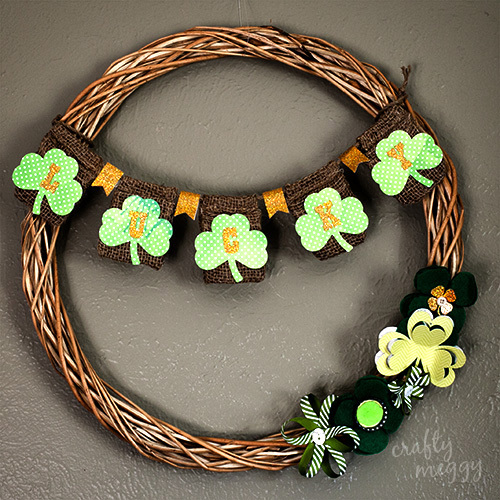 My favorite part of the wreath is the lucky banner!! I just think it’s so cute!! 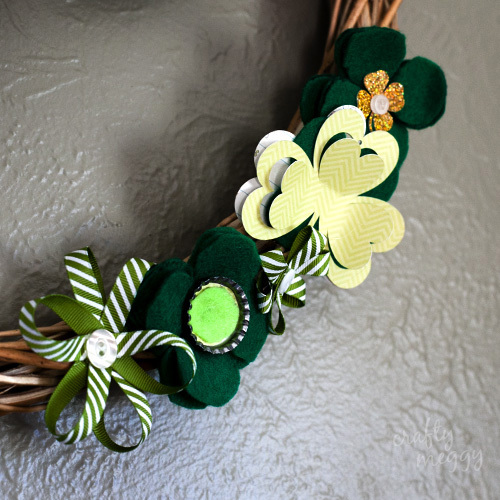 I found the idea for this wreath on pinterest. You can check out the original blog post over at Tattered and Inked, which is now one of my new favorite blogs to visit! turned out really cute- I meant to tell you yesterday! This is so cute! 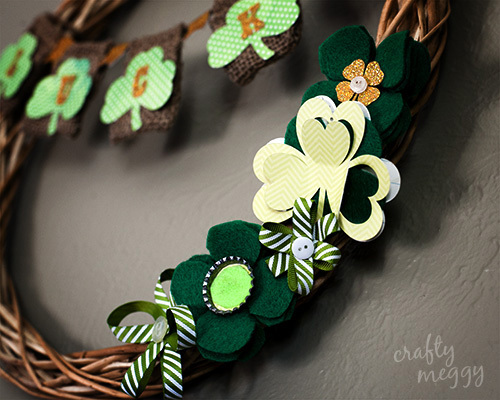 I need to get some more St. Patrick’s day decor!